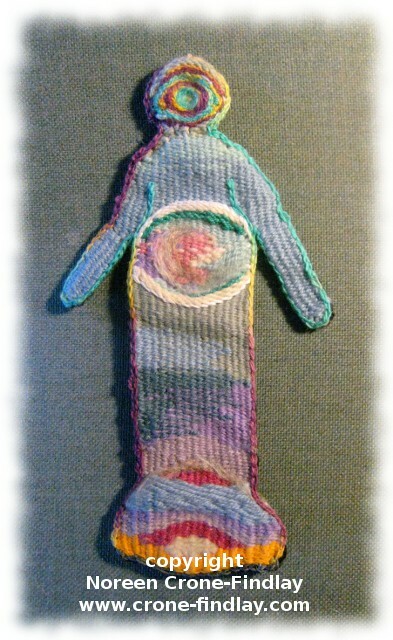 Today’s Tapestry Diary is ‘Tiny Dog’. A small dog with a huge heart. This is an homage to a very small dog that we are caring for while his people are dealing with tough stuff. Raeleen has had a liver transplant and other surgery, so we are helping out by caring for their darling little dog for as long as they need us to. We have fallen completely in love with him, and he is doing just brilliantly. It will be hard to have him go home again, but it will also be perfectly fabulous, because it will mean that Rae is well enough to be back at home! We live in amazing times- medical expertise is astonishing, and our friends are going to have more years together because of that, and I feel blessed. I was thinking about the miracles around us, and about the love that connects us all- to friends, to animal companions, to family in all the ways it is created. It fills me with gratitude. 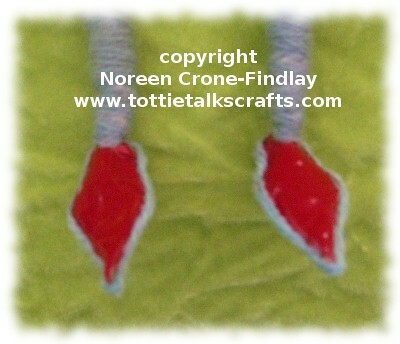 I tried something new- I added a twisted cord (I used the Thumbelina loom to make it… I must show how I did that!) to the outside edge. And, then I pressed it. Derp. 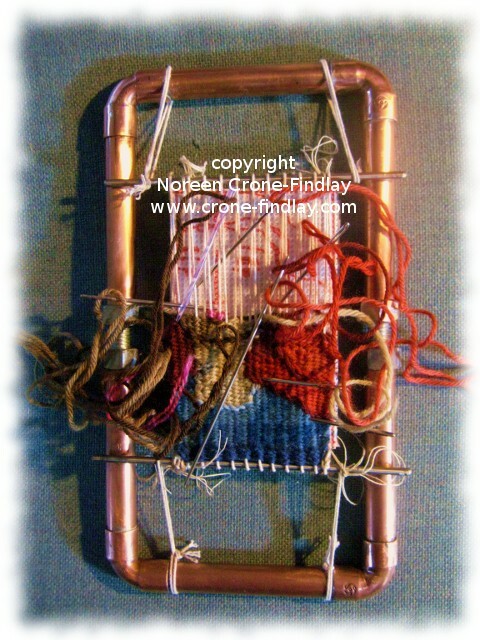 STEAM tapestry – don’t PRESS it! the lovely corded edge went all floopy from being pressssssssed. sigh. I know that! I know that…. Trying to get the detail of a Chihuahua face into that small a space proved verrrrrrrrrrrrrry challenging. Feel free to try things and see how it goes- even if it’s not technically perfect, it’s still a learning time, and a time out of the day for quiet contemplation and meditation, so Win/Win. The other day, a friend mentioned to me that she has been checking my blog and was concerned that I haven’t been posting lately. 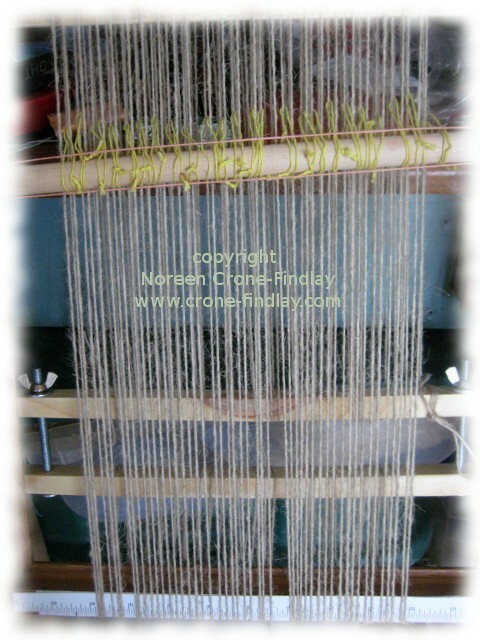 Well, one of the reasons is because I have been working night and day for months, on a new little loom that I have designed- the Thumbelina. 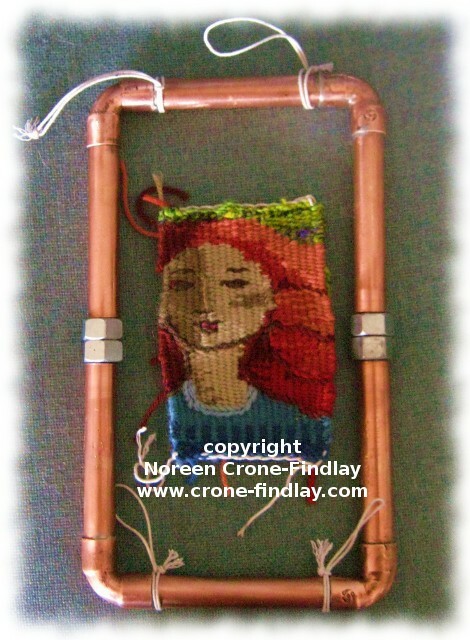 One of the things that has really captured my imagination with the Thumbelina loom is weaving tapestries on her. Weaving very tiny Tapestries has some challenges- working my way to achieving a ‘thumbnail’ image that reads clearly what my intentions are can be tricky, and is a fascinating process. I am utterly hooked by working on such a small scale- I love the sketching process, and then am always surprised by how the weaving and then the embroidering afterwards makes the tiny tapestry so engaging. 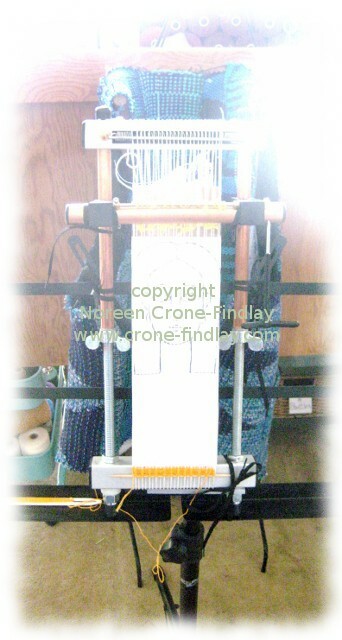 Because of the immediacy of weaving at such a small scale, it is the perfect way to weave tapestry diaries. Tapestry diaries are usually woven in small units of a larger tapestry, as a reflection of the day to day life of the weaver. 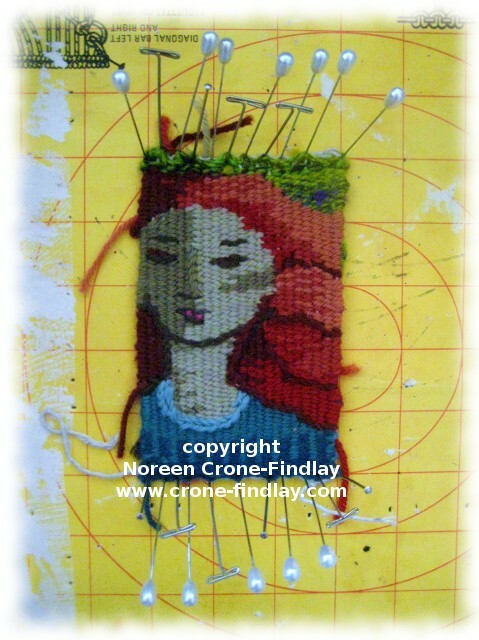 Weaving Thumbelina tapestry diaries is kind of a reverse… I am weaving tiny tapestries that I will then be attaching to a larger piece to make them part of a cohesive unit. 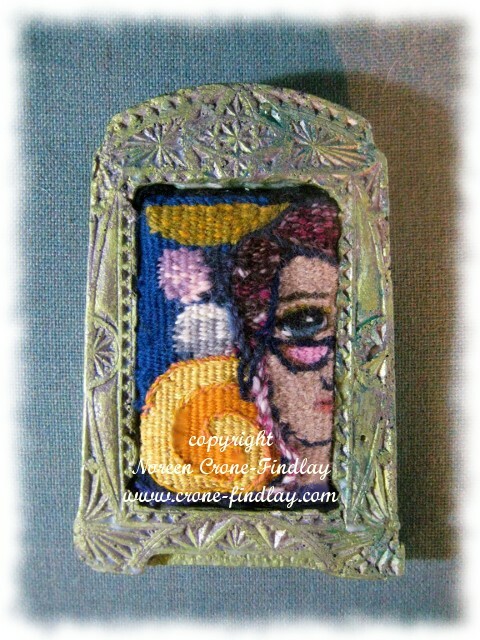 Tiny Tapestry Diary pieces woven on the Thumbelina loom. 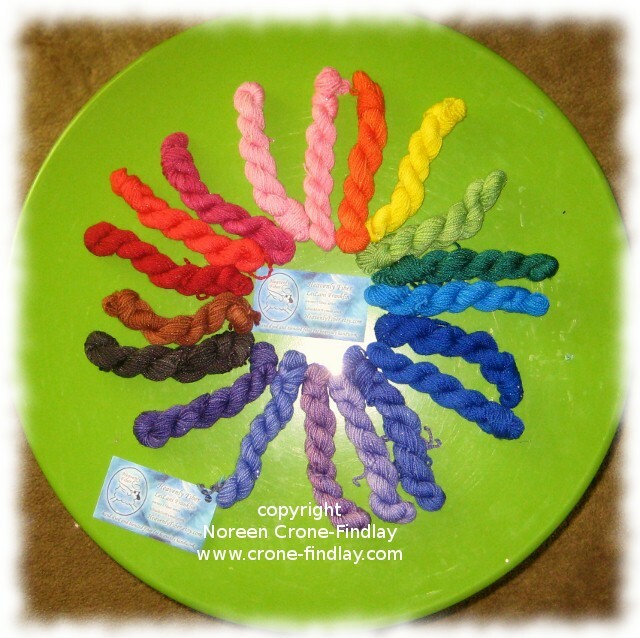 The first 3 tapestry diaries that I have woven have been meditations on my life this May…. 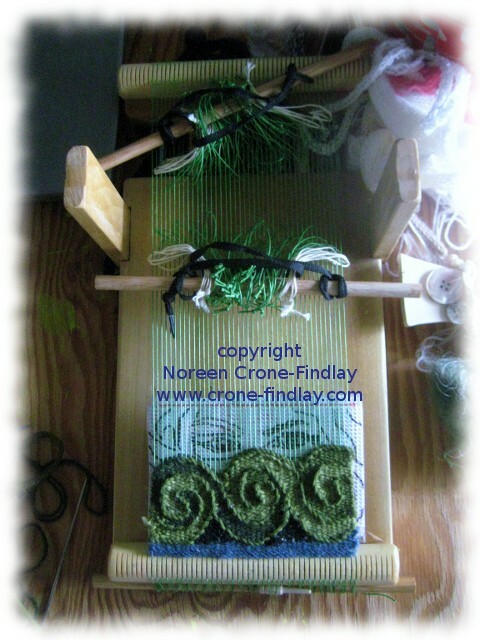 Tiny Tapestry Diary of May apple tree flowers woven on the Thumbelina loom. 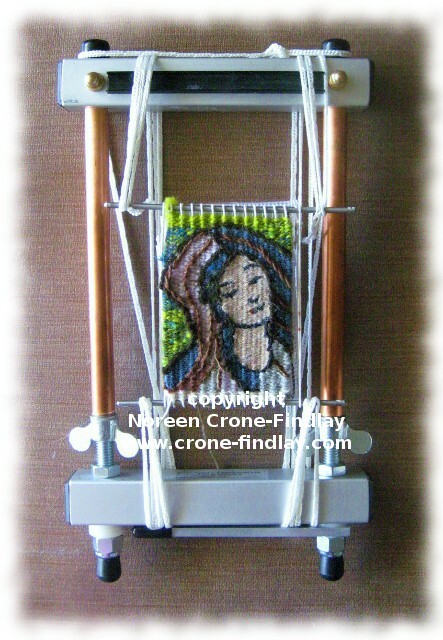 Tiny Tapestry Diary of a prayer for rain woven on the Thumbelina loom. 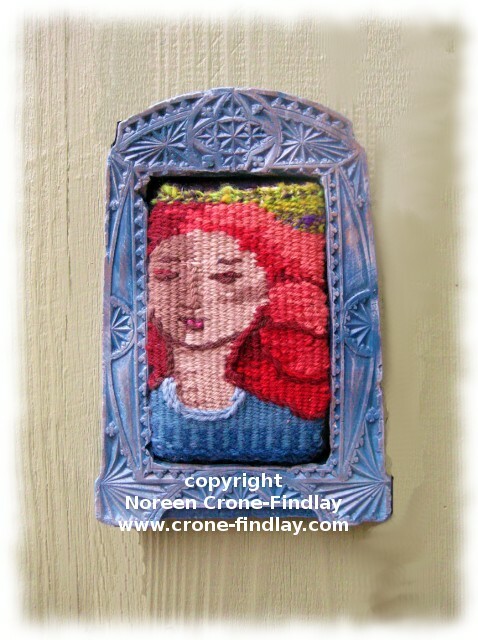 Tiny Tapestry Diary of a Fairy Door to remember a lovely dream, woven on the Thumbelina loom. 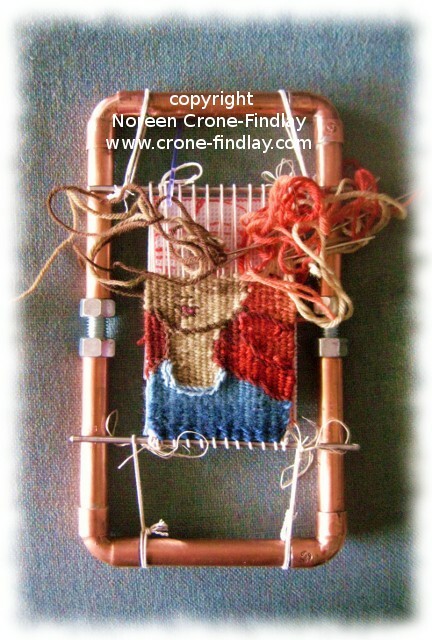 I am loving weaving tapestry diaries again. Joy! 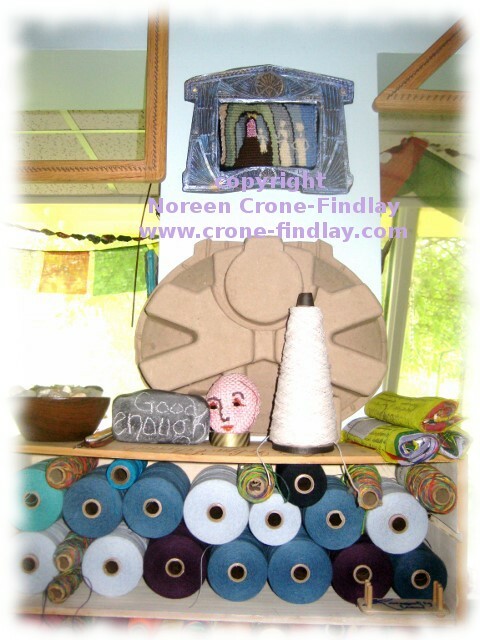 I have committed to a year long project on Ravelry- weaving a tapestry diary. 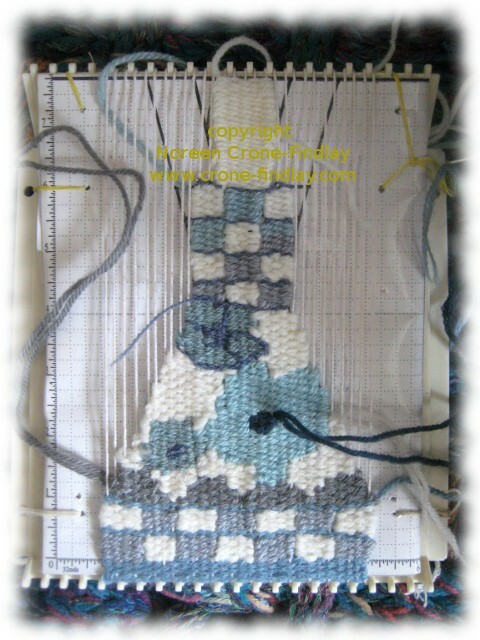 I didn’t quite finish my May tapestry diary piece in May…. I just finished it today. 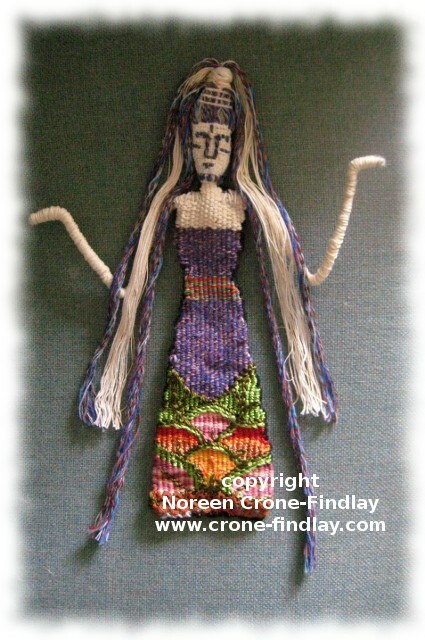 I have been bothered and irritated by one of the eyes and just wasn’t happy, so had to do some serious unweaving and unpicking. I am still not quite there with it, but it’s going to be on the loom until I weave the next diary piece (I warped enough to weave several small diary entries) so, I can puzzle over it more, or simply accept it as is. 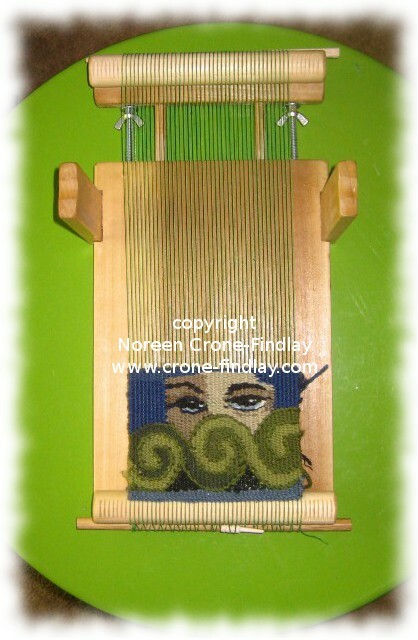 It’s called: Woven Women- Spiral Eyes. May was very challenging for us, with the death of one of dear old dogs, the destruction of my website by hackers, then, learning that the gallery that was supposed to be hosting the solo show of my tapestries and other woven works has been botched by the builders, so the gallery can’t open this year- so my show is cancelled. Then, we learned that a long, long time friend is very ill. Rough, rough month…. and in the news, the school girls in Nigeria still not being released, as well as troubles all over the planet…. oh my…. is that we simply have to come from a place of compassion…. I will be framing it in one of my painted plaster frames when it comes off the loom. Thank you, thank you, LeiLani! So very beautiful!!!!!!! and soooooooooooooo appreciated!!!!! 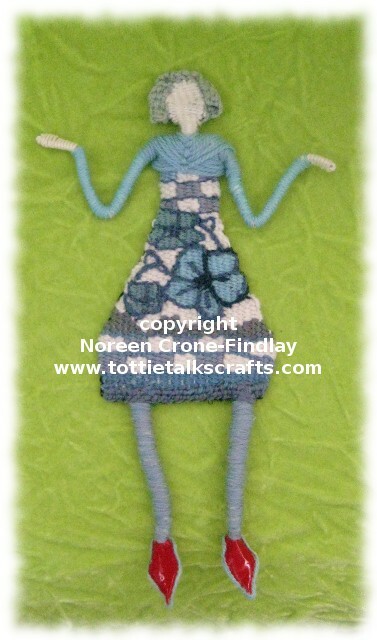 Today, I finished another of my tiny tapestries: “Woven Women- Blue Dress”. The tapestry is 3 inches by 5 inches (approximately). 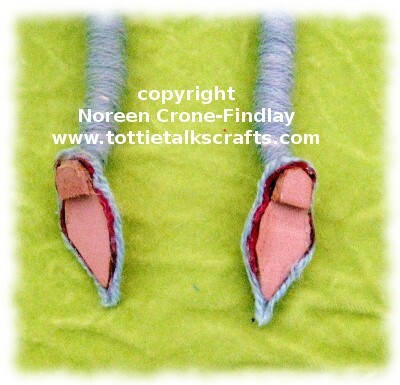 The frame is about 5 inches by about 7 inches (also approximate).